Shock waves from one Wall Street scandal after another have completely disillusioned us with our banking system; yet we cannot do without banks. Nearly all money today is simply bank credit. Economies run on it, and it is created when banks make loans. The main flaw in the current model is that private profiteers have acquired control of the credit spigots. They can cut off the flow, direct it to their cronies, and manipulate it for personal gain at the expense of the producing economy. The benefits of bank credit can be maintained while eliminating these flaws, through a system of banks operated as public utilities, serving the public interest and returning their profits to the public. This book looks at the public bank alternative, and shows with examples from around the world and through history that it works admirably well, providing the key to sustained high performance for the economy and well-being for the people. Order here. Ellen Brown has written what will become one of THE most important books of our time. She eloquently educates us on how the democratization of money is the very foundation of a free society. Ellen brilliantly shows how money can be the current or currency that facilitates the spiritual experience of manifesting our collective intentions for a better world. Her book is an absolute game-changer and a must read for all those interested in having a world that works for everyone. Buy it, read it, and tell everyone you know to do the same. This is a must read! Ellen Brown is the leader of the public banking movement and this masterful work is certain to become the go-to book for anyone interested in transcending the speculation-driven global financial system—and helping lay sound foundations for the fast-emerging New Economy. Brown has done it again. The Public Bank Solution follows her Web of Debt, a brilliant analysis of privatized banking, how it has usurped the money creation power, and how we can get it back. Public banking is the antidote to corrupted, dysfunctional privatized banking, the way forward for sustainable long-term growth and prosperity. 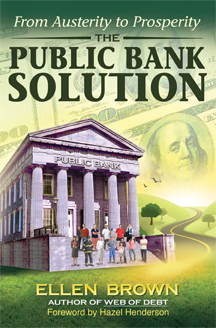 The Public Bank Solution explains an idea whose time has come. Ellen, I want to recommend a public bank to the Washington State legislature at a lobby day in February, 2017, but I’m not sure how best to present the idea concisely and attractively. Can you recommend some text that I could use? Sounds like we get an education of the secrect plans of those remaining wealthy on our dime. The links under EXCERPTS (above) are broken, they take you directly back to this page. Now local bank branches are closing maybe county owned banks with district branches may be better than state owned; and they would probably be more considerate towards local business. And coupled to real local democracy instead of party dominance.